Woohoo, three weeks in a row! I’m finally back on track to post several articles a week, all in an effort to help others remember or learn ways to use the American system of grammar, usage, and language. 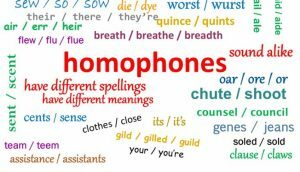 Tuesday Tricksters are based mostly on showing you homophones, those words that sound alike (or nearly so), but are spelled differently and mean something completely different. As I mention EVERY week, spellcheck will not help us with them; if we spell a word that spellcheck recognizes as correct, spellcheck will accept it. So, let’s (lets) take a look at five more (moor) pairs (pears) of words that can confuse many writers, to (too, two) make sure (shore) we (wee) all (awl) realize the importance of checking every single darn word we write (right, rite)! One (adj. ): a single entity, unit, object, or living being: I ate one peach; (n.): a quantity: I have the one I need; (pron. ): an individual of a vaguely indicated group; anyone at all: Joe saw one of his friends there. Won (v.): past tense of to win: Amy won the bet. Oohs (inter. ); used variously to express surprise, enthusiasm, delight, displeasure, etc. appose them in perfect orientation. So five pairs of words — were any of them new to you? I had never known appose existed, and I’m not sure I’ll ever actually need to know. For even more help, check out YourDictionary.com, where you’ll find definitions of words from several dictionaries all in one spot. My goal here is to help you look and sound as smart as you are.